intro: The Centers for Disease Control and Prevention estimates that every day, 200,000 Americans contract food poisoning. But Philip Tierno, Ph.D., a microbiologist at New York University medical center and author of The Secret Life of Germs, pegs the true eat-'em-and-weep rate at around 800,000 a day. "Everyone in this country will have at least one incident of sickness this year attributable to a foodborne virus, bacteria, or toxin," Tierno says. Except that most of us won't know what hit us; we'll chalk up the usually mild symptoms -- nausea, diarrhea, cramping -- to "that stomach flu that's going around." quicklist: 1 category: The 10 Dirtiest Foods You're Eating title: Chicken url: http://www.menshealth.com/fitness/50-ways-prepare-chicken-breast?cm_mmc=ABCNews-_-Top%205-_-The%2010%20Dirtiest%20Foods%20You're%20Eating-_-50%20Ways%20To%20Prepare%20A%20Chicken text: The dirt: Never mind cigarettes; the Surgeon General should slap a warning label on chicken. Recent nationwide testing by Consumers Union, the advocacy group behind Consumer Reports, notes that of the 484 raw broilers examined, 42 percent were infected by Campylobacter jejuni, and 12 percent by Salmonella enterides. At home: To help prevent foodborne illness, bypass rinsing your raw bird in the sink, and instead put it directly into a baking dish or pan. This shortcut reduces the odds of sullying counters and other foods, says Janet B. Anderson, R.D., director of the Safe Food Institute in North Logan, Utah. If you used a cutting board, clean it (and the knife) with a mild, dilute bleach solution. As for your heat treatment, cook breasts and other cuts until the temperature hits 180°F. (If it's a whole bird, take the temperature in the thickest part of the thigh.) "Poking the chicken or judging by juice color is risky," says Anderson. That said, chicken is one of the leanest, most protein packed meals you can eat. Learn these 50 Ways to Prepare Chicken to keep this meat delicious, meal after meal. quicklist: 2 category: The 10 Dirtiest Foods You're Eating title: Ground Beef url: text: The dirt: Even a little ground chuck can make you upchuck. 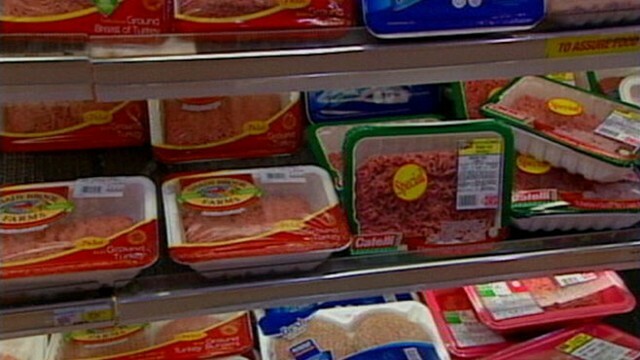 When USDA inspectors last tested hamburger meat, they looked at 563 sources nationwide and discovered Clostridium perfringens in 53 percent of the batches, Staphylococcus in 30 percent, and Listeria monocytogenes in 12 percent. Interestingly, the USDA found no trace of Escherichia coli 0157:H7, a.k.a. E. coli, one of the desperadoes of foodborne illness. Despite this finding, if slaughterhouse safeguards fail (and they sometimes do), E. coli could potentially pop up in your next patty. At home: Add fresh oregano to your burgers and meat loaf. When researchers at Kansas State University mixed a variety of common household spices into ground beef to test their antibacterial properties, oregano tested as one of the best at wiping out E. coli. Use at least 1 tablespoon per pound of meat. Just as important, flatten your patties -- thick burgers will char on the outside before the interior reaches the required 160°F. quicklist: 3 category: The 10 Dirtiest Foods You're Eating title: Ground Turkey url: text: The dirt: Potentially one of the foulest of the fowl. A USDA survey showed that the odds are better than one in four that your ground gobbler contains Listeria, Campylobacter, Clostridium, or some combination of the three. What's more, in a separate study by the FDA and the University of Maryland, 24 percent of the ground turkey sampled came back positive for Salmonella. And some of that Salmonella was resistant to antibiotics. quicklist: 4 category: The 10 Dirtiest Foods You're Eating title: Raw Oysters url: text: The dirt: Oysters' power as an aphrodisiac is overblown, but their power as a diarrheic when slurped raw is not. These filters for ocean waste can contain the norovirus (a pathogen notorious for nixing ocean cruises), Campylobacter, and Vibrio vulnificus. University of Arizona researchers who studied oysters from so-called certified-safe beds discovered that 9 percent were contaminated with Salmonella bacteria. Still hungry? "We found E. coli in 100 percent of Gulf Coast locations, and in high amounts," says Lynn Joens, Ph.D., the study author. quicklist: 5 category: The 10 Dirtiest Foods You're Eating title: Eggs url: http://www.menshealth.com/mhlists/saturated_fat/?cm_mmc=ABCNews-_-Top%205-_-The%2010%20Dirtiest%20Foods%20You're%20Eating-_-8%20Fatty%20Foods%20With%20Health%20Benefits text: The dirt: Which is dirtier, the chicken or the egg? The chicken, by a long shot, or so it seems at first. More widespread pasteurization has reduced the rate of Salmonella contamination in eggs to only one in 20,000. But that still leaves more than two million hazardous eggs in circulation each year. Food poisoning linked to eggs sickens an estimated 660,000 people annually and kills 300. "Often, dishes made at restaurants are from pooled eggs," which increases the risk, says Schaffner. "It's really a matter of statistics. Eat an egg sunny-side up and your risk of Salmonella is one in 10,000. Eat an undercooked omelette made from a mix of 100 eggs, and the risk is significantly higher." (That being said, eggs have received a bad reputation because they contain saturated fat—but there's no reason to fear them. Discover the 8 "Fatty" Foods with Health Benefits, and quit depriving yourself. quicklist: 6 category: The 10 Dirtiest Foods You're Eating title: Cantaloupe url: http://www.menshealth.com/mhlists/how_to_pick_the_best_produce/index.php?cm_mmc=ABCNews-_-Top%205-_-The%2010%20Dirtiest%20Foods%20You're%20Eating-_-How%20To%20Pick%20The%20Best%20Produce text: The dirt: File this under "Who knew?" When the FDA sampled domestically grown cantaloupe, it found that 3.5 percent of the melons carried Salmonella and Shigella, the latter a bacteria normally passed person-to-person. Among imported cantaloupe, 7 percent tested positive for both bugs. And because you eat melons raw, the bacteria go right down your gullet. That's a big part of the reason why from 1990 to 2001, produce in general has sickened as many people as have beef and poultry combined. At the supermarket: Dents or bruising on the fruit can provide a path in for pathogens. (Find the best fruits and vegetables by learning How to Pick Fresh Produce.) But don't think precut cantaloupe is safer. "I've been in several supermarkets where the produce was cut by personnel who didn't wash their hands after handling eggs and other items," says Anderson. quicklist: 7 category: The 10 Dirtiest Foods You're Eating title: Peaches url: text: The dirt: Being pretty as a peach comes at a price. The fruit is doused with pesticides in the weeks prior to harvest to ensure blemish-free skin. By the time it arrives in your produce department, the typical peach can be coated with up to nine different pesticides, according to USDA sampling. And while apples tote a wider variety of pesticides, the sheer amount and strength of those on peaches sets the fuzzy fruit apart. On an index of pesticide toxicity devised by Consumers Union, peaches rank highest. quicklist: 8 category: The 10 Dirtiest Foods You're Eating title: Prepackaged Lettuce url: text: The dirt: Don't look now, but the lettuce on a burger could cause you more grief than the beef. Outbreaks of E. coli sickened 36 people in San Diego in September 2003 and sent 29 people reeling in eastern Washington in July 2002. In both cases, prepackaged lettuce was to blame. And according to the Center for Science in the Public Interest, lettuce accounted for 11 percent of reported food-poisoning outbreaks linked to produce from 1990 to 2002, and "salad" accounted for 28 percent. quicklist: 9 category: The 10 Dirtiest Foods You're Eating title: Cold Cuts url: http://www.menshealth.com/mhlists/best-worst-sandwich-meats/index.php?cm_mmc=ABCNews-_-Top%205-_-The%2010%20Dirtiest%20Foods%20You're%20Eating-_-The%20Best%20And%20Worst%20Sandwiches text: The dirt: Germs don't take a number in the deli; cold cuts have been labeled at "high risk" of causing listeriosis by a joint team of researchers from the USDA, FDA, and CDC. While only 3 percent of the deli meats sampled contained Listeria at the point of purchase, the bacteria's rapid growth rate on cuts stored even under ideal conditions concerned researchers. Combine that with the fact that cold cuts are, well, eaten cold, and you've got trouble; Listeria thrives at refrigerator temperatures that stun other foodborne pathogens. At home: From now on, skip the sniff test and trash whatever meat you haven't eaten in a week. When you're ready to build your sandwich, slather on the mustard. Researchers at Washington State University killed off 90 percent of three potent pathogens -- Listeria, E. coli, and Salmonella -- within two hours of exposing them to a mustard compound. And be sure to use this list of The Best and Worst Sandwich Meats to choose the ingredients that will fill you up without filling you out. quicklist: 10 category: The 10 Dirtiest Foods You're Eating title: Scallions url: text: The dirt: Scallions play a bit part in most dishes, but a little goes a long way, as evidenced by the massive hepatitis A outbreak at that Chi-Chi's in October 2003. Dirty scallions have also triggered small hep A outbreaks in Georgia, North Carolina, and Tennessee. Other bugs known to have grabbed a ride on green onions include the parasite Cryptosporidium, Shigella, and the ever-present Salmonella. In FDA tests, U.S.-grown scallions carried Salmonella or Shigella in 3 percent of samples, nearly twice the number detected in imported samples.